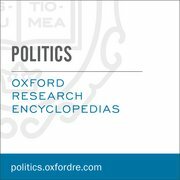 Substantive, peer-reviewed, and regularly updated, the Oxford Research Encyclopedia of Politics combines the speed and flexibility of digital with the rigorous standards of academic publishing. China is playing an ever-increasing role on the world stage of international relations, and it is starting to bring its own vocabulary to the part. The terminology that comprises the core lexicon of international relations theory originates from Greek and Latin, and it was developed to describe and interpret the configurations of power that have been common in Western history, from ancient Athens to the British Empire. Chinese scholars are now actively mining the Chinese historical experience to develop new terms to apply both to their own past and to an ever-changing present. Different histories call for different vocabularies. Over three millennia, China has developed a distinct vocabulary that is well-adapted to its own place at the center of the East Asian world-system. The Chinese word for China, Zhongguo, literally means ‘central state or states’ (there is no plural inflection in Chinese), giving rise to the poetic sobriquet “Middle Kingdom.” Thus, China is not the land of the Han or the empire of the Qin, but simply the country in the middle. But in the middle of what? Again, the Chinese language has a distinctive term: tianxia, literally “sky beneath” but more idiomatically translated as “all under heaven.” Sometimes taken to mean “the world,” tianxia instead refers to “a world,” in the sense of a world-system. Ancient Chinese historians were aware of the existence of places far beyond the borders of China (like India, Persia, and even the Roman Empire) but they did not consider these places to be part of “their” world, the Chinese tianxia. For the historian Wang Gungwu, tianxia depicts an enlightened realm that Confucian thinkers and mandarins raised to one of universal values that determined who was civilized and who was not.” Its nearest Western equivalent might be the Medieval concept of Christendom, a particular type of tianxia tied together not just by shared Christian belief but also by participation in shared rites. We might also speak of an ancient Greek tianxia in the Aegean Sea in the years before the Persian Wars, or of an ancient Indian tianxia centered on Brahmanic tradition. The difference between China and these other tianxia candidates is that while the others were transitory, China’s tianxia seemed to be eternal—at least until the incorporation of China into the Modern World-System centered on Western Europe. From the beginning of history until the fall of the Ming dynasty in 1644, China was the central state or states, the lower-case zhongguo, of the East Asian tianxia. Chinese culture was for two millennia the mother, and measure, of East Asian civilization. That pattern only ended with the dissolution of the previously isolated Chinese tianxia into the larger, globalizing world. Over three millennia, China has developed a distinct vocabulary that is well-adapted to its own place at the center of the East Asian world-system. The Chinese tianxia thus differed from other historical examples in two ways: it was a permanent (not transient) configuration, and it had a universally acknowledged center. The Mongols may have conquered China in the thirteenth century, but they didn’t attempt to govern it from Mongolia. China was the center of their world, every bit as much as it was the center of Japan’s world, Korea’s world, and Vietnam’s world. These relationships were reflected in the tributary system, which sometimes reflected Chinese power to demand tribute and at other times China’s need to beg for support, but always placed China at the center of the system. Then came the West. From the 1600s until the end of the twentieth century, international relations vocabulary flowed in only one direction: from that larger world into China. Western military power forced China to accommodate itself to Western notions of sovereignty, to redefine itself first as an empire (under the Manchu Qing dynasty) and then as a republic (under Sun Yat-sen and later Chiang Kai-shek and Mao Zedong). Today Xi Jinping seems eager to redefine China once again, this time as a nation-state. All of these are Western terms suited to the modern world. Drawing on pre-modern Chinese history and philosophy, the emerging Chinese School of international relations is, however, developing a new terminology of Confucian relationality. Philosopher Zhao Tingyang’s historically-inspired tianxia system sits at the center of this approach. Zhao sees the tianxia understanding of a unified world as the basis for a new form of globalism. I myself have incorporated Zhao’s ideas into an interpretation of the post-modern world-system as a new central state system focused on the United States, an American Tianxia based on a philosophy of liberal individualism. The Chinese School of international relations is unlikely to supplant established international relations theory, but it’s certain to enrich it. The concepts of the central state or states (zhongguo) and of a world-system based on universal values (tianxia) are useful additions to our terminological toolkit for understanding the world. They may apply to historically-existing world-systems for which Western vocabulary is inadequate, or they may indeed apply to the new world-system form that is emerging from contemporary globalization. China is certainly a key component of the twenty-first century world. Its philosophical heritage is indispensable for interpreting Chinese history to that world. It may also prove helpful for making today’s world meaningful to ourselves. Featured image credit: Building water historical by danist07. Public domain via Unsplash. Salvatore Babones is an American sociologist, professor at the University of Sydney, and an expert in the areas of Chinese and American economy and society. He wrote the article "Taking China Seriously: Relationality, Tianxia, and the “Chinese School” of International Relations" for the Oxford Research Encyclopedia of Politics. I think that the rest of the world will have to take more and more note of China. It certainly offers a clear lesson about the effect of improved literacy, which most Anglophone countries still fail to appreciate. I believe that China’s big economic leap forward has been greatly assisted by raising its literacy level from 15% in 1958 to 95% now, with adoption of Pinyin. It was originally designed by Zhou Youguang for helping children learn to read traditional Chinese writing, but it is now also used for typing on electronic devices and may gradually replace traditional Chinese writing altogether. In Anglophones countries functional illiteracy is only around 18%, but still relatively high among developed countries. Perhaps they too should be trying harder to find new ways of reducing it?